Logitech has today officially announced its Revue set-top box and accessory range for the forthcoming Google TV platform. The box, which will bring a host of web-based content to any HDTV, was unveiled by Logitech EVP of Consumer Products Junien Labrousse at a special press conference in New York this evening. The Revue box, which will cost $299, will integrate with some DVRs as well as offering a full flash-web browsing experience and a host of channels and apps such as Pandora and Netflix in the USA. The device, on sale the end of October, will also benefit from Google Voice Search, split screen viewing/browsing and DNLA server compatability to enable users to stream media content. The company has also announced a very attractive, lightweight QWERTY keyboard, which will ship with the device and link with the Revue box to boast the same functionality as the impressive Logitech Harmony universal remote. There'll also be remote control apps for iPhone, iPad and, naturally, Android as well as a cute handset-sized mini remote called the Logitech Mini Controller. 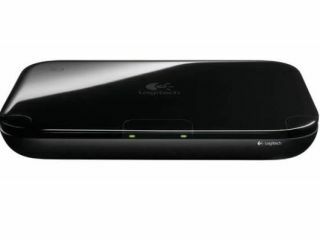 A Logitech HD webcam for 720p video conferencing was also unveiled by Labrousse at the event. That'll be an additional $149. Much like Apple's AirPlay functionality, Android phone owners will be able to transfer content between their handset and Google TV. Logitech's announcement beats Sony to the punch, with the Japanese giant still to officially announce its range of Sony Internet TV sets with built in Google TV functionality. All products are available to pre-order in the US from BestBuy and Amazon and will be ready to ship by the end of the month.